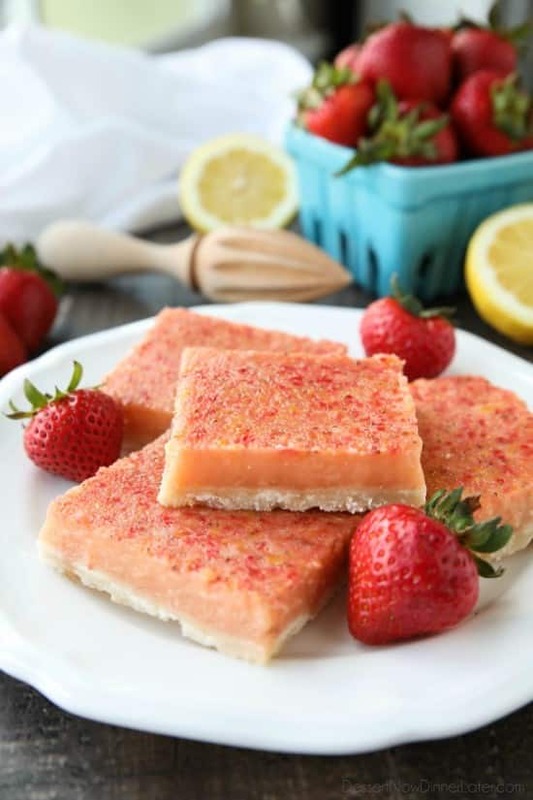 Strawberry Lemonade Bars - Dessert Now, Dinner Later! 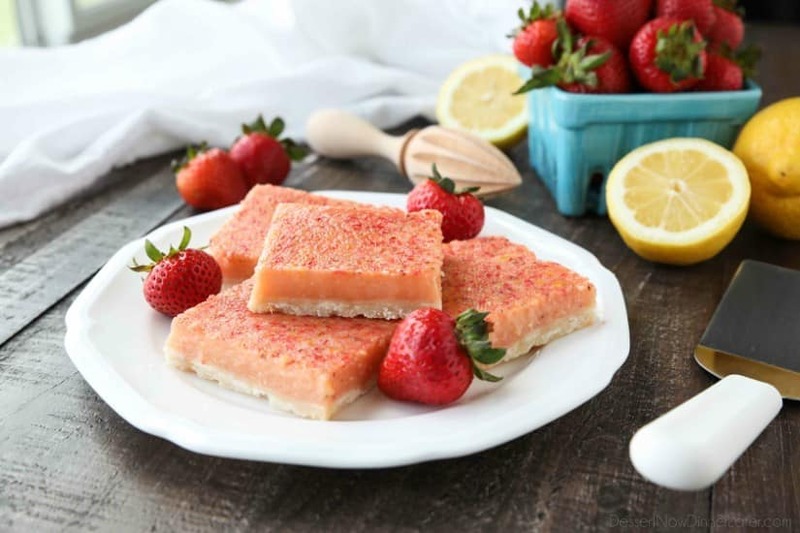 Strawberry Lemonade Bars combine fresh, ripe strawberries with classic lemon bars for a delicious sweet and tangy summer dessert. 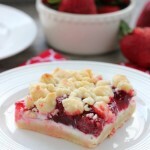 These strawberry lemonade bars are a lot like pie, and I love pie! They have a buttery shortbread crust and a tangy-sweet fruit filling. 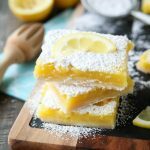 Bar desserts are simply some of my favorite treats because they are super easy to make, with endless combinations. 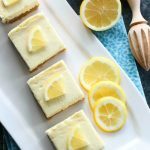 This strawberry lemon duo was a major hit with my family and friends! 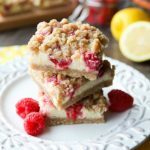 Although I love tangy citrus desserts, the strawberries mellow out the tartness of the lemon just enough, that it makes these strawberry lemonade bars perfectly sweet and extra fruity. 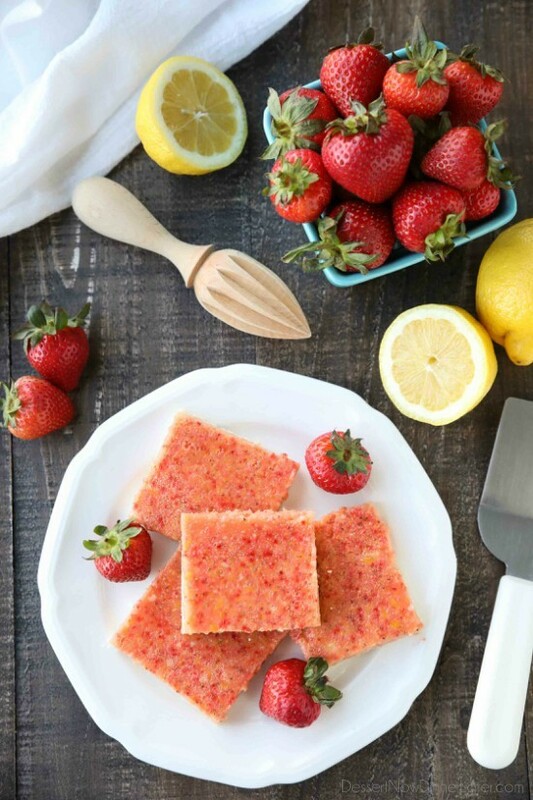 The texture is still like a lemon bar, but is SO pretty with the specks of strawberries. I didn’t want to cover that up with powdered sugar, but you can definitely top these with powdered sugar if you want. A great dessert for your summer potluck or picnic! 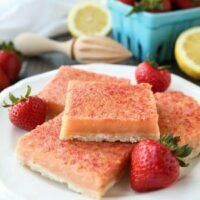 These strawberry lemonade bars will be devoured right away! Meanwhile make the filling: In a food processor or blender, pulse the lemon zest (optional), lemon juice, and strawberries until smooth. Whisk together the sugars, flour, and salt in a bowl. Add the eggs and yolk, one at a time, whisking well after each addition. Add the strawberry-lemon puree and mix until everything is smooth and combined. Pour filling over hot crust and return to oven to bake for an additional 18 to 22 minutes. When done, the filling will no longer jiggle and a toothpick will come out clean when pressed into the center. Let bars cool to room temperature in the pan. Chill in the refrigerator for 2-3 hours before serving. If parchment was used, lift bars out of the pan before cutting. Dust with powdered sugar if desired. Store leftovers in the refrigerator. * Choose firm strawberries over soft, super ripe berries. The more ripe, the more moisture, which may produce a softer filling or cause trouble setting. I’m so glad you liked them Wendy!